Bank President George Leis will not receive three times his base salary plus incentives if he loses his job as was erroneously reported in the caption of the print edition. That was according to a change-in-control clause in his previous contract that was not carried over into his current one. If banks could be characters in Greek tragedies, Santa Barbara Bank & Trust would make a good candidate. All the plot lines are there: the brilliant ascent, the hubris, and the fall, which was punctuated yesterday by the bank’s sale to UnionBanCal Corporation, the Mitsubishi-owned, San Francisco-based parent company of Union Bank. The acquisition was not bad news for everyone, least of all Texas banker Gerald Ford, who paid $500 million for most of the bank’s equity on August 31, 2010 to save it from failing to meet federal capital requirements. Union paid $1.5 billion for Pacific Capital Bancorp, the parent company of SBB&T, 1.6 times its book value. And it was all smiles at the headquarters of SBB&T on Anacapa Street Monday morning when President and COO of SBB&T George Leis announced the news to area media along with Tim Wennes, vice chairman of Union Bank. But the mood was more akin to shock at the Fess Parker DoubleTree on East Beach where, at the same moment, many of Santa Barbara’s movers and shakers were attending the mayor’s state of the city breakfast. The news quickly rippled through the crowd, said Janet Garufis, president of Montecito Bank & Trust, who arrived at 7:15 a.m. unaware of the acquisition. By the time she sat down for breakfast at 7:30, she said, the whole room knew. 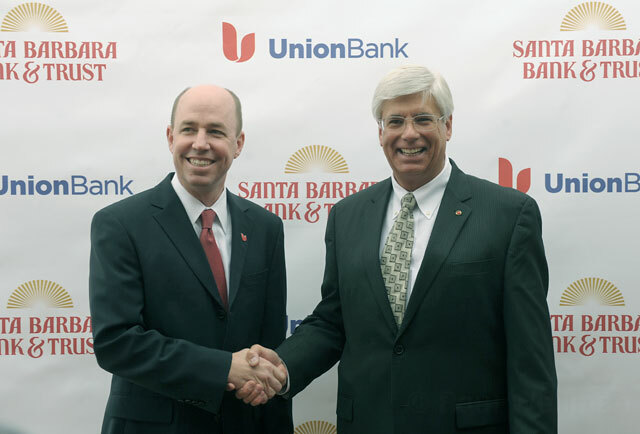 At Monday’s press conference, Tim Wennes said that Union Bank will start phasing out the name Santa Barbara Bank & Trust during the first quarter next year. The actual merger is pending approval by regulators expected in the fourth quarter of this year. Wennes said that they don’t expect to reduce staff that interface with customers and that the transition will be seamless for account holders. Leis added that he is holding town hall meetings with employees to keep them apprised of changes. The two executives said it’s too early to speculate on personnel changes, but Garufis, who has been through two bank mergers herself, said that layoffs should be expected. One purpose of merging is to cut overhead. And strategically, the acquisition fills a gap for Union, the second largest bank holding company in California, which currently has no presence between Solvang and Thousand Oaks. SBB&T was founded in 1960 by three partners — Ralph Raddue, Reuben Irvin, and Louis Lancaster — and grew from small community bank to regional powerhouse. In the ’90s, it started acquiring banks further afield of Santa Barbara and expanding its footprint on the Central Coast. When the housing bubble burst in 2007, SBB&T found itself exposed to bad home loans. In the time leading up to the housing crisis, SBB&T also had difficulties integrating data from banks it had acquired with its own database. Former senior vice president of trusts and investments from 2000-2003, James Herrell believes those technology issues made it even more difficult for the bank to ascertain all of the toxic assets on its books. He also believes that senior management was positioning SBB&T to be acquired by a bigger bank. In 2009, the bank’s federal regulator ordered it to cease one of its more profitable if controversial activities — issuing Refund Anticipation Loans (RALs), high-interest, short-term loans backed by tax refunds. In March of that year, SBB&T announced plans to lay off 22 percent of its workforce, or about 300 employees. It would report losses of $421 million as its stock price plunged below a dollar. Those employees who had invested their retirement accounts lost nearly everything. It was widely expected that Ford — who made his fortune buying, rehabilitating, and selling troubled banks during the savings and loan crisis — would eventually sell SBB&T, but members of the Santa Barbara banking community are uniformly stunned at both the speed at which he found a buyer and the price he garnered. The Independent reported interest from Union Bank early in 2010, so it is likely that Union had already done diligence on a merger and remained interested after Ford bailed it out. “You already had a buyer who had some level of interest. All you had to do is put some lipstick on it,” said Eloy Ortega, president of the Bank of Santa Barbara. One remaining question is whether Union Bank will continue SBB&T’s strong commitment to the community, including generous giving to nonprofits and philanthropies. While Cushman worried that the leaders of a bank that is no longer locally owned will have little connection to the community, SBB&T spokesperson Deborah Whiteley insisted that giving will not diminish after the merger, explaining that Union has a policy of donating 2 percent of its after-tax net profits to nonprofits.